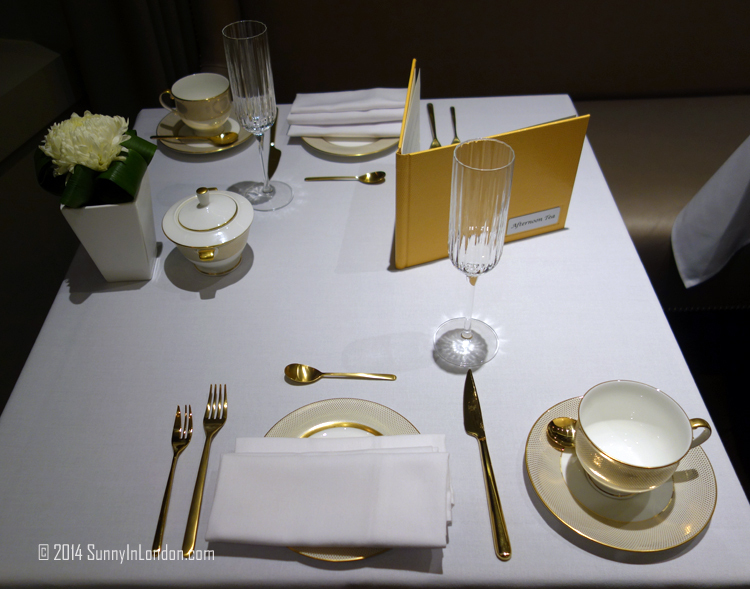 What in the world could a 24 Karat Gold Afternoon Tea menu possibly look like? And, better yet, how can you have a chance to enjoy it? 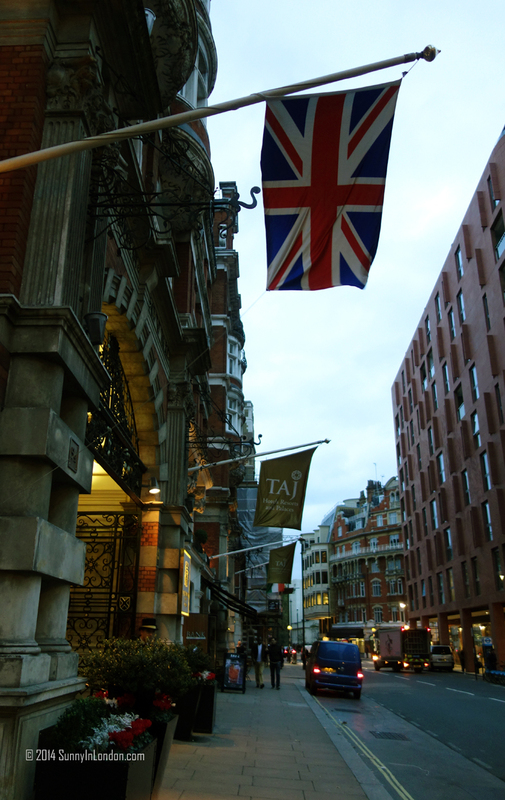 Through another partnership with Zomato, Sunny in London is featuring a golden opportunity! Oh, I’m not kidding, Sunny friends. 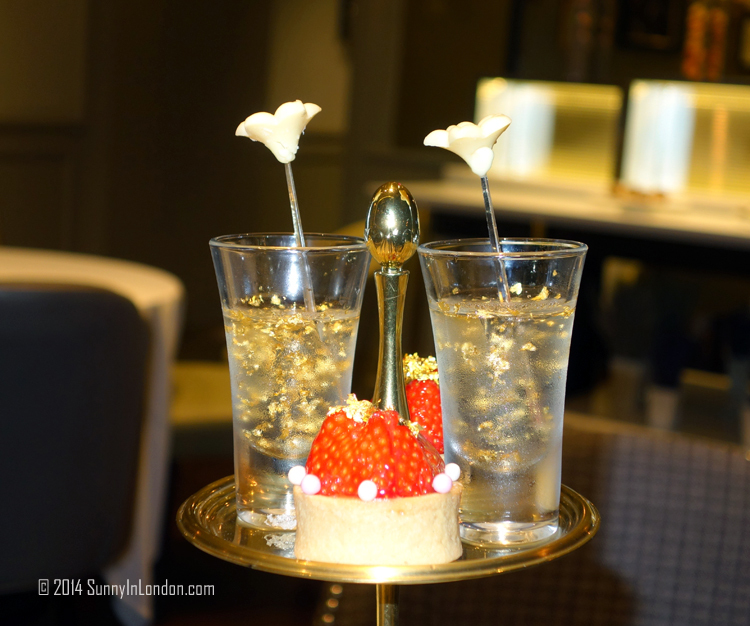 You’re about to find out how you can win a £150 voucher for an afternoon tea menu which literally features gold. 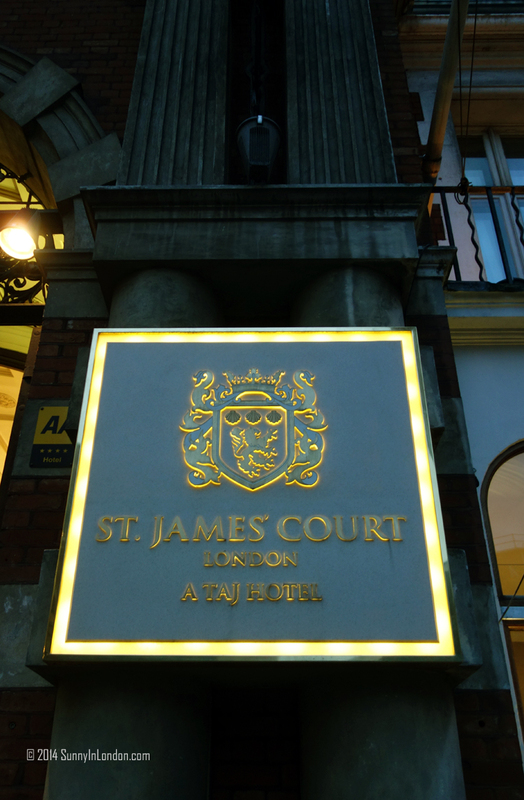 Our yellow brick road begins with a walk to the St James Court, a Taj Hotel. 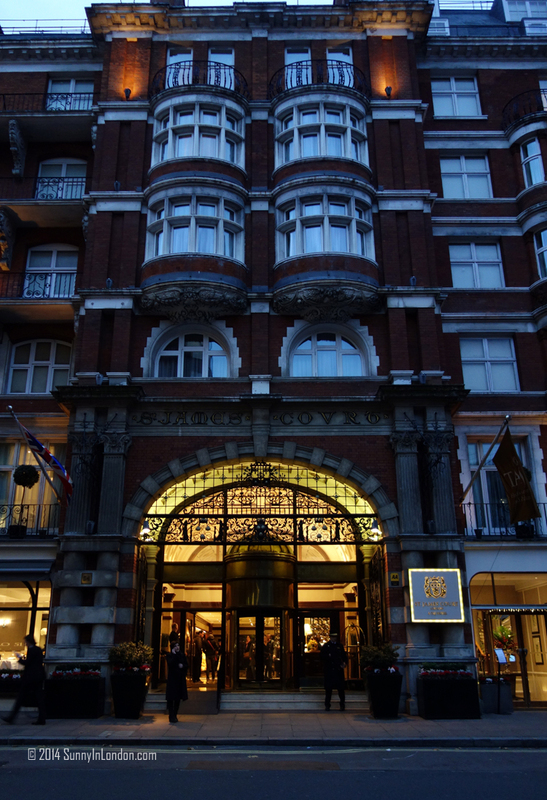 It’s located at 54 Buckingham Gate, London SW1E 6AF. You probably don’t need a map to figure out that it’s right near the ‘house’ of her Royal Highness. 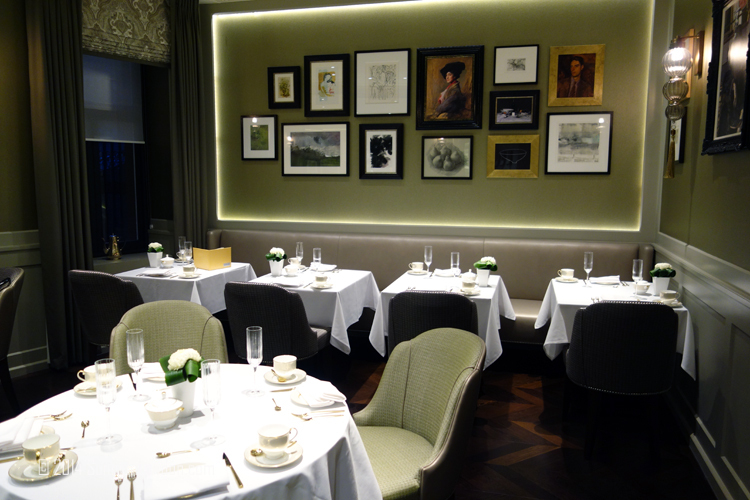 And here’s the vault for the super luxurious afternoon tea menu. 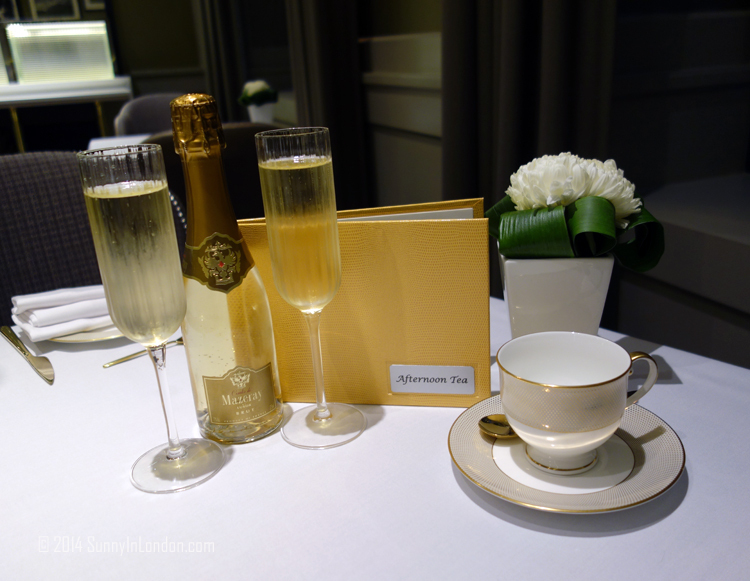 Your tea begins with a beautiful bottle of bubbly, and of course a selection of tea. I sipped on the English Breakfast tea during my feast. 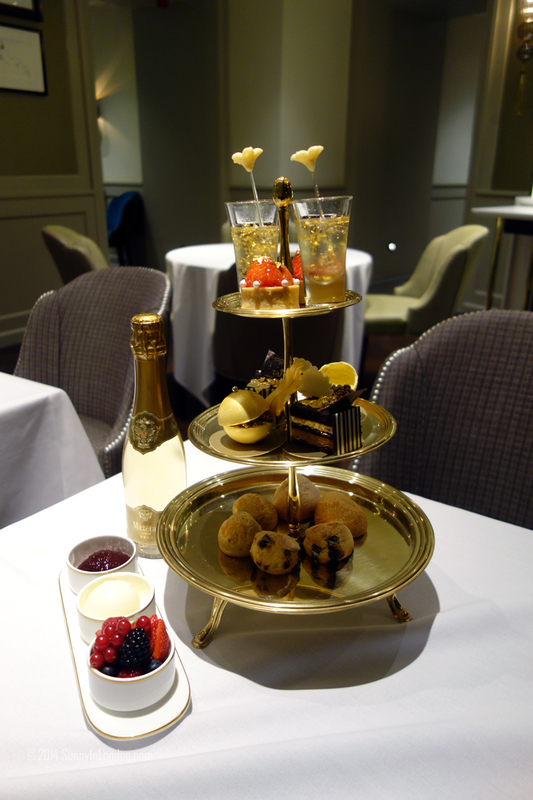 However, the Kir Royale tea was truly tempting. 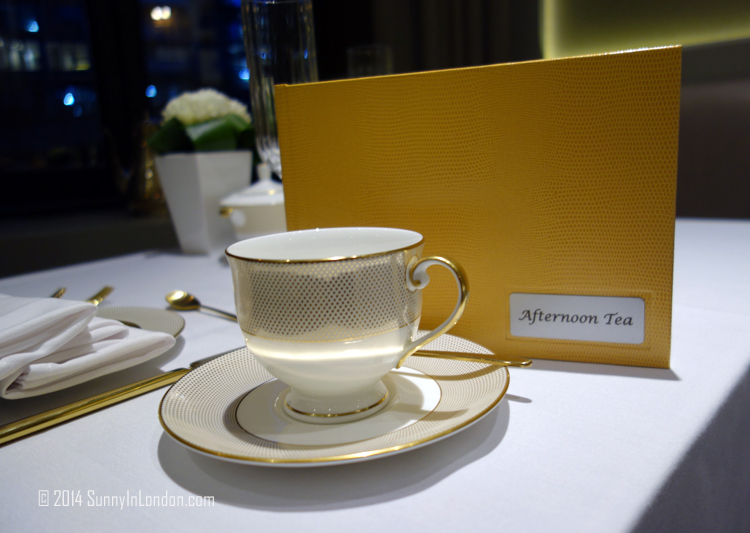 So, let’s take some time to dig through this afternoon tea menu covered in gold. Now, let’s lay our eyes on the glittering images of all this food and champagne! 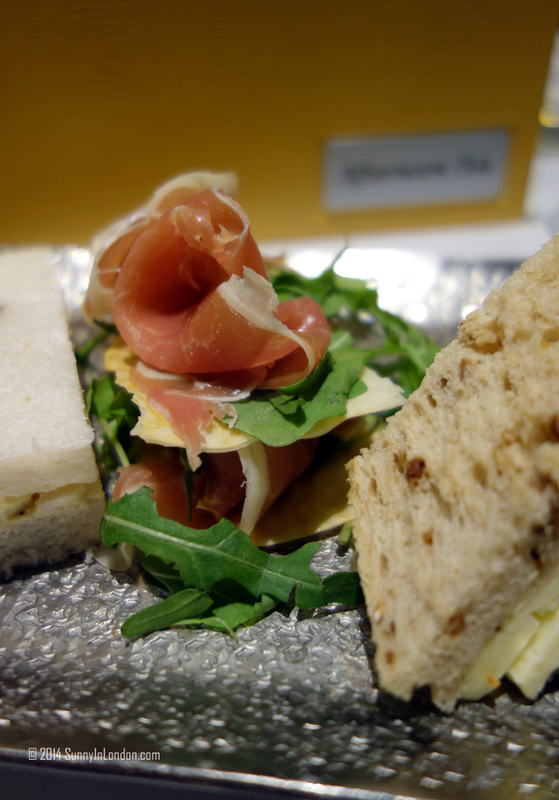 That is the first delivery of food in this bedazzling afternoon tea menu. In all honesty, this was my favourite part, aside from the champagne, my darlings! The Parma Ham (AKA Prosciutto for my American mates) was divine! Look spectacular? 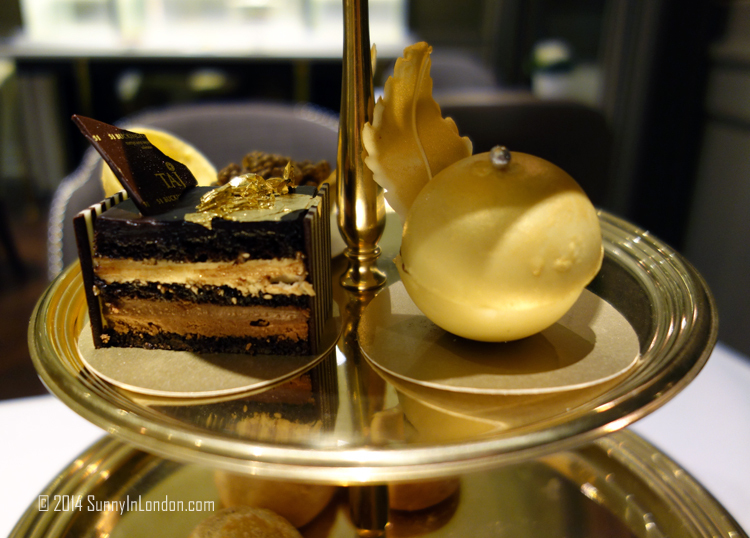 I’m telling you, this gorgeous gold leaf opera cake and white chocolate delight with gold leaves made me want to stand on my chair and sing! Hallelujah! Hark the Herald, angels are singing when those golden babies hit your lips! Now, I can’t imagine you aren’t tempted by those rich visuals. 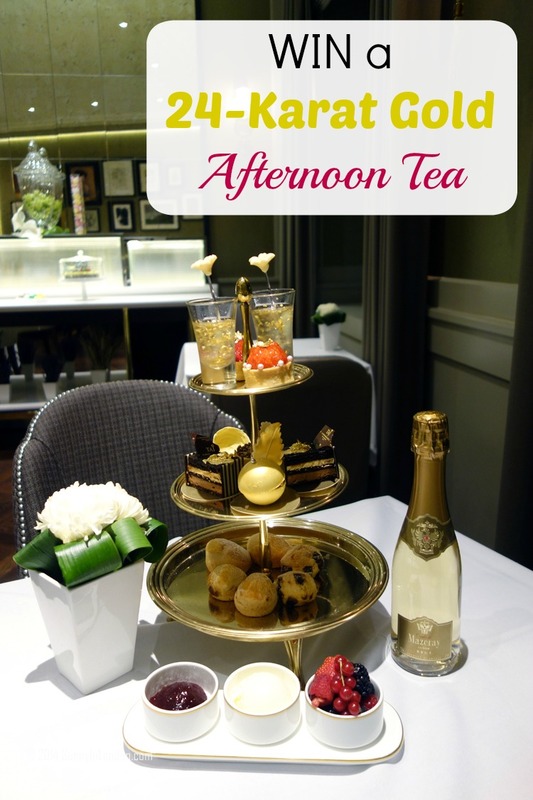 So, do you want to know how you can hit this afternoon tea menu jackpot? – You have until Tuesday (November 18, 2014) at 12:00pm (GST) for the retweet. 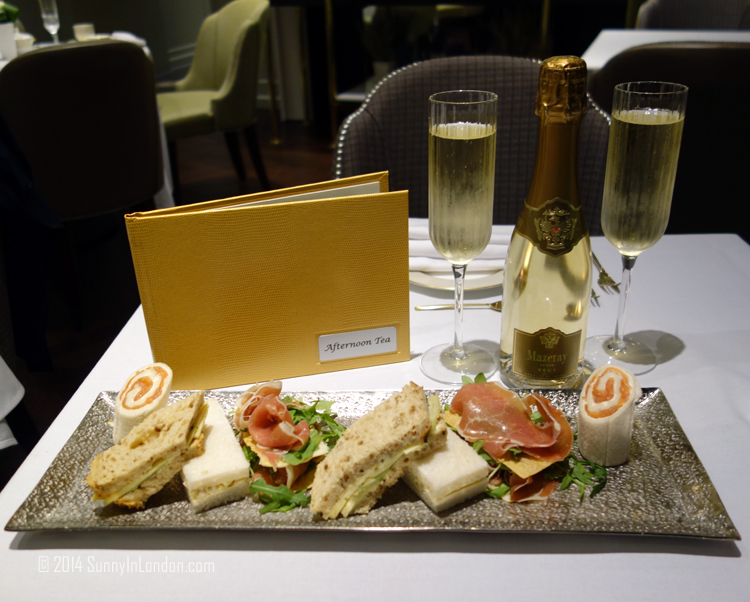 – The gold afternoon tea menu voucher for £150 expires on January 15, 2015, so it must be used by the winner before then. – If you win, don’t forget to visit Zomato to pour your love on to their site by writing a review. – Zomato also has an app (which I use several times a day) that you can download. So, Sunny friends… who will it be? Will this seat at the table belong to you? The London Eye: Advice on how to Fly High! Hi Lucy! I can’t say enough how delicious and decadent the tea is. The pictures really don’t do it justice! Melanie, I’m so excited about this – I’ve booked a date for early in the new year and reading this post again is filling me with even more anticipating!! Happy Holidays!